Paul Burmeister (born March 10, 1971) is currently a Studio Host and Play by Play announcer for NBC Sports. Paul Burmeister has been an NFL Studio Host and Play by Play announcer for NBC Sports since 2011. Burmeister primarily hosts NBC Sports's daily NFL studio show, Pro Football Talk on NBC Sports Network, but can also be seen filling in for Dan Patrick on The Dan Patrick Show. In 2011 and 2012, Burmeister was the lead play by play voice for NBC Sports Network's coverage of Mountain West Conference Football, working alongside NFL Hall of Famer Rod Woodson for the 2012 season. He called the Bayou Classic in New Orleans in 2011 and 2012, on NBC, in addition to The US Army High School All Star Game, also on NBC. His work at NBC has gone beyond football, providing play by play for Mountain West Conference basketball in 2012 and 2013, hosting on site MLS coverage in 2012, and hosting Madden NFL 2012 Kickoff on NBC. Burmeister also lends his voice to NBC's track and field coverage as well as their PBC Boxing series. Burmeister moved over to NBC Sports, full-time, from NBC Sports Network, in August 2014. In 2015, Burmeister Filled-in for Michele Tafoya during 2015 Pro Football Hall of Fame Game on NBC Sports. 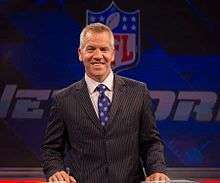 In 10 seasons at NFL Network, Burmeister hosted NFL Total Access, NFL Gameday Scoreboard, Around the League Live, Path to the Draft, Playbook, College Football Scoreboard and College Football Now. From 2007 to 2014, Burmeister served as lead anchor for NFL Network’s studio draft coverage. Each year he, Mike Mayock and Charles Davis kicked off the network's pre-draft coverage at The Senior Bowl in Mobile, Alabama in late January before moving on to the NFL Scouting Combine in Indianapolis in February. Then each day from late February through the end of the draft, he hosted"Path to the Draft" live in Los Angeles. His play by play duties at NFL Network included calling The Senior Bowl and East-West Shrine Game alongside Mike Mayock and Charles Davis from 2011 - 2014. He also called The Insight Bowl in 2008 and 2009 with Mayock, and served as lead Play by Play announcer for NFL Network's "Arena Football Friday" from 2010 - 2012. From 2007 - 2011 Burmeister was the preseason play by play voice for the Jacksonville Jaguars, working alongside Tony Boselli. After the stint with the Jaguars, and since 2012, he has been the preseason voice for the Kansas City Chiefs, working with Trent Green. Burmeister started his broadcasting career in August 1998 at KCRG-TV in Cedar Rapids, IA, working for 3 years as a reporter and sports anchor, as well as color commentator for KCRG Radio's high school football game of the week. In August 2001 he took over as Weekend Sports Director at NBC affiliate KWWL in Waterloo, Iowa. For 3 years he anchored and reported, as well as hosted KWWL's Sunday night 30 minute show "Sports Plus." Beginning in 2006, and for each of the last 8 years, Burmeister has hosted The 101 Awards in Kansas City, the nation's longest standing and only award banquet dedicated solely to the NFL. In 2012, he hosted The Bronko Nagurski Awards, given to the nation's top college football player, in Charlotte, NC. In addition to holding two degrees from the University of Iowa (B.A., 1994, M.A., 1997), Burmeister also played quarterback for Hayden Fry from 1989 - 1993. He started the final 3 games of the 1992 season, and every game in 1993. Burmeister was named offensive captain prior to the 1993 season, and voted MVP at the conclusion of the season that ended with a berth in the inaugural Alamo Bowl. He was invited to participate in the NFL Scouting Combine, after his senior season, and in 1995 spent 5 months with the Minnesota Vikings as a free agent. Burmeister was an all-state quarterback in 1988 and named Mississippi Valley Conference Player of the Year. He was also a 3-year letterman and all-conference performer in basketball and baseball, graduating as the school's all-time leading scorer in basketball. ↑ Tadych, Frank (February 23, 2008). "Wright hoping to get some attention at the combine". NFL.com. Retrieved 2012-02-25.